Today’s visual landscape is more cluttered and distracting than ever before – and it can be difficult to compete in this environment. Embracing new digital signage technologybefore your competitors can help you stay one step ahead and distinguish your message from the ‘visual white noise’. Engaging viewers with interesting and stimulating content is a key element in all advertising, and digital signage solutions are no different. The emergence of glasses-free 3D digital signage technology, or autostereoscopic 3D, is set to soon change the way in which content is delivered. Without the aid of 3D glasses, advertisers will be able to create truly engaging campaigns that ‘leap off the screen’. And consumers are going to take notice because autostereoscopic 3D is a great tool for delivering a dynamic blend of advertising and entertainment. Traditional 2D signage has now officially lost is novelty value, so 3D signage coupled with good quality content has the capacity to excite viewers in much the same way as the first colour TV advertisements. But glasses-free 3D signage technology alone isn’t a magical solution. A new medium won’t compensate for hackneyed old ideas. In fact, the key to using this effectively lies in carefully thought-out, creative content and an understanding of what this technology can and can’t do. Creating content for autostereo requires professionals with a sound working knowledge of 3D graphics programs such as 3D studio and Maya; 3D content development programs; and many other facets of 3D production. However, the scope for amazing animations and truly engaging dynamic video content is immense. As digital signage software developers begin to navigate their way around the world of autostereoscopic 3D signage, we are going to see some important changes in the way digital signage captivates and engages viewers. The technology breaks through the barrier of viewers being mere spectators, because autostereo signage reaches out to viewers and demands their active engagement. 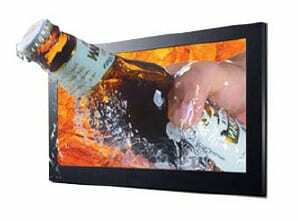 Are you thinking about using 3D digital signage for your future advertising campaigns?